This oceanfront villa accommodates a maximum of seven guests in its spacious four bedroom suites. The upper floor of the main building is where you will find the common living space, kitchen, dining, shared terrace and infinity pool. 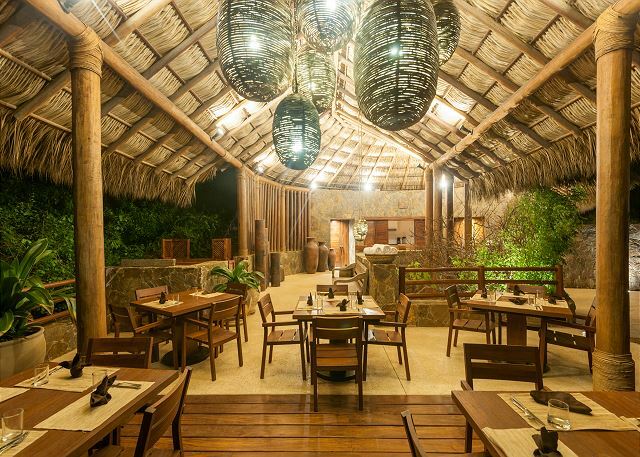 The main living space features an open-air design, breathtaking views, and a traditional palapa-style roof; attributes that together serve as a welcomed reminder of your tropical surroundings. On the lower level, the first of the three masters as well as the fourth bedroom, and media room can be found. The media room showcases a 60" LG Smart TV with Blu-ray home theater system and Sky satellite. Crossing the bridgeway will take you over to the two additional master suites; one on each level. Three of the bedrooms feature king size beds, while the third features one single size bed. Each suite is a private sanctuary, complete with ocean views, custom carpentry, beautiful finishes, 47" LG TV, sun-soaked terrace, and ensuite bathroom with unique outdoor shower. The fully appointed kitchen showcases stainless steel appliances, beautiful natural stone countertops, a flat screen TV with HD home theater system, and all the upgrades. Looking to fully relax? Inquire about having a personal chef during your time at the property. 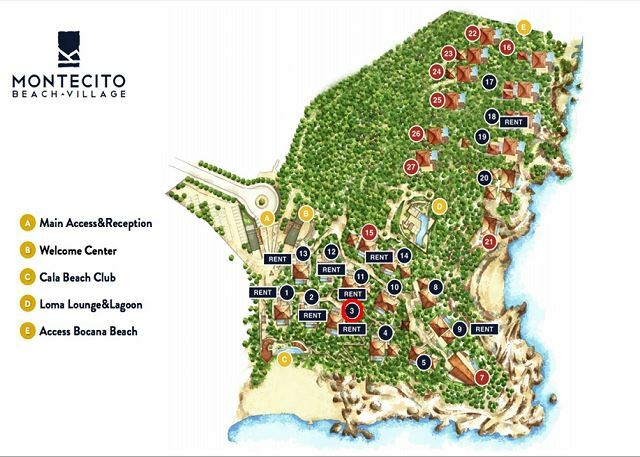 Beyond the luxury and beauty of the villa itself, Montecito Beach Village delivers an unparalleled resort experience. Offering two beachfront areas, one complete with a full-service beach club and shared oceanfront pool, this property offers the perfect holiday setting. A quick open-air tram ride will take you down to the beach that beckons you below. Exit into the development's chic beachfront restaurant and beach club to enjoy a bite to eat or a swim in the shared infinity pool, before your feet find their way to the sand. Looking for more? Enjoy a stroll along one of the development's many nature paths down to Playa La Bocana where you can try your hand at surfing! The service staff and hotel-style daily maid service serve to contribute to a stress free vacation.